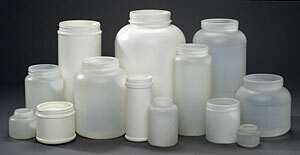 Our jars and canisters come in a variety of weights, quantities and neck sizes. We will customize to meet customer specifications. Our jar capacity ranges from 2 ounces to 9 quarts, while our canisters range from 100 to 120 millimeters or 36 to 100 ounces. We have the ability to run custom colors and will custom pack products to meet our customer’s unique needs. We have the capability to handle multi-million volume orders, but will run quantities as low as 3000.